"It can be towed by a mid-sized car, van or pickup truck"
It is smaller and generally lighter than a Fifth Wheel Trailer, which means it can be towed by a mid-sized car, van or pickup truck (this could mean using a lot less fuel to get where you are going). Depending on the model you buy or rent, you will have all the comforts of home. 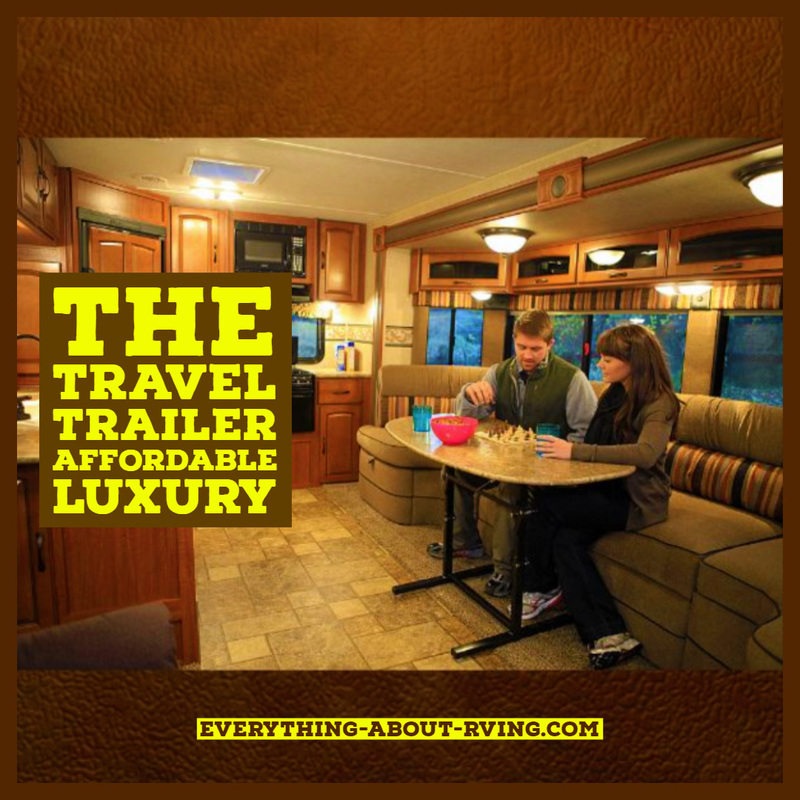 Unlike the Fiver (Fifth Wheel Trailer) these trailers have a single level floor plan. If you are looking for a reasonable amount of living space at a reasonable cost than this is the RV for you. 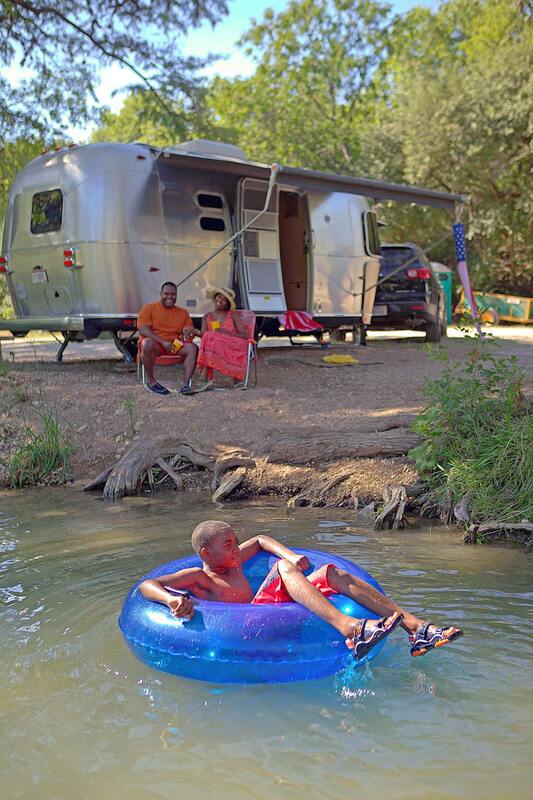 Most Travel Trailers are fully self-contained for camping out in the boonies. They can also be equipped with room slideouts that increases the size of available living space when camped (more room for dogs, cats, kidlets, grandchildren or you). The length of these RVs vary between 8 to 35 ft. If your motto is "have toys will travel" then this trailer is for you. A Toy Hauler is a Trailer or Fifth Wheel that has been designed to carry your toys such as quads, dirt bikes, dune buggies, your favorite Harley or even a small car. They have a big back door that doubles as a ramp. Your toys are stored in a mini-garage behind the main living area of the trailer. Once you are at your camp sight and you have removed all of your toys, these mini-garages can be converted to useable living space such as a bedroom, etc. (this depends on the model you have). These special trailers can have up to 3 axles dependant on the weight they are designed to carry. 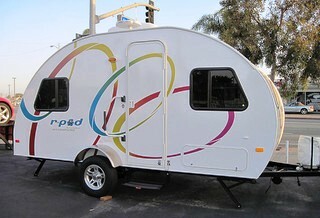 The name of this trailer pretty much describes its appearance it looks like a small teardrop. These little trailer's roots goes back to the 1930s when they were very popular. Early in the 1960s their popularity started to decline, due to the availability of larger trailers and Motorized RVs. However in the last few years there has been a renaissance (I have always wanted to use this word in a sentence) in the Teardrop Trailer category. Quite a few hobbyists have bought some of these old trailers and restored them back to their original condition. There are even kits that are available so that you can build your own tiny Teardrop Trailer (if you are handy with tools and have a lot of time on your hands you can give this a try). One important fact to remember is that these trailers are SMALL. They range from 8 to 10 feet in length and 4 to 5 feet in heighth (ideal for a small couple). Needless to say this is not ideal for a family of four. There are even Teardrop Trailer Rallies, where all of the Teardroppers (I just made that name up maybe it will stick) get together at Teardrop rallies to show off their tiny trailers. Take a look at the video we recently shot for EARV to demonstrate how easy it is to setup Expandable (Hybrid) Travel Trailers. We would like to thank Bill Durkee from CustomRV inc. located in Anaheim California for conducting this great demonstration for us. These are also known as Hybrid Trailers. These unique trailers are a cross between a normal Trailer and a Tent Trailer. In order to create more sleeping space these trailers have pop-out ends or sides like a Tent Trailer. Don't confuse this with a room slideout. Room slideouts have solid walls and ceilings, the pop-out has canvas walls and ceilings like a Tent Trailer. These pop-outs allow these RVs to comfortably sleep up to 8 people in a modest sized trailer. Some of these pop-outs are configured with bunk beds, creating even more sleeping space. Now you will have no excuse for not inviting all of your relatives to go camping with you. The Expandable trailer is less expensive than a similar sized trailer with room slideouts. Hopefully, the above information will be helpful in steering you in the right direction. If you have decided that a Trailer is the right type of RV for you, you should now head over to the Buying a RV section of this web site to get some more helpful hints.